Having dealt with antichess, let's move back east. Shogi is the main chess variant in Japan. The game has existed there in many forms for centuries since Chaturanga crossed from mainland Asia. It became the most popular of these variants and the others went into decline. It directly translates as 'General's board game'. Shogun is the Japanese word for General and gi means game. It is widely believed that Shogi became popular because of the drop rule. Around that time when enemy soldiers were captured in battle, they would agree to fight for their captors as a means of survival. The drop rule in Shogi allows a player to return his opponent's captured pieces to the board as his own. 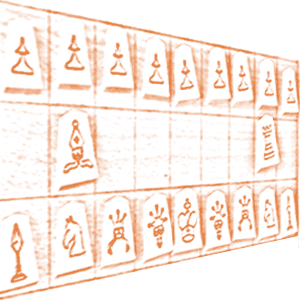 You can add your own Shogi stories to the website if you wish. Chaturanga spread from India in two main directions. These two branches each spawned new variants as they went that are closely related. One branch spread west through Persia, the Gulf region, North Africa and finally into Europe. It produced similar games such as Shatranj and Western Chess. The other went north into China, then Korea and on into Japan. All of the South-East Asian variants are from this side of the family. It's believed that chess in one form or another arrived in Japan as early as a thousand years ago. Pieces and literature dating from the 11th Century have been found. Modern Shogi evolved from these variants. Shogi is played on a 9x9 gameboard. The pieces are flat as in Xiangqi but they are five-sided wedge-shaped pieces rather than discs. Both sides start with a king, two gold generals, two silver generals, two knights, two lances, a bishop, a rook and nine pawns. The object is to checkmate the opposing king. The board is not checkered like a Western chessboard. All squares are the same color. Even the two armies have no difference in color or marking. Pieces are identified as one side or the other by the way they are facing. Even so the two sides are called Black and White with Black moving first. A captured piece can be used by the other side when later returned to the board facing in the other direction. Every piece except the king and gold generals can promote if they wish by reaching the final three ranks of the board. The pieces are weaker than Western pieces and they operate on a bigger board. Engagement therefore takes longer. The first priority is to castle the king to safety. There are different castling formations depending on the opening chosen. Players can use the Yagura castle, the Mino castle or the Anaguma castle. Most pawns get captured early on and get dropped in later on the other side behind enemy lines where they can be promoted to a gold general. This is done by flipping the piece over on the other side to reveal a different marking. The endgame begins when one player breaks through his opponents lines. He will now try to checkmate the king. At this point the king may try to flee to the center of the board where he will be harder to mate. Very often both players will be breaking through at more or less the same time and then it's a race to checkmate. You can play Shogi online for free. I can point you to a couple of these. Let's start with a computerized opponent and some good links at Japanese Chess. You can find another good alternative over at Play OK.
Shogi is played in many parks and streets all over Tokyo. 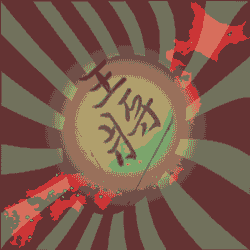 It has been part of Japanese life for 1,000 years and is now part of the national identity, the national psyche. There must be a wealth of great stories and tales from Shogi history dating back through the centuries. Do you have an amazing tale from Shogi's rich history? Your story will appear on a Web page exactly the way you enter it here. You can wrap a word in square brackets to make it appear bold. For example [my tale] would show as my tale on the Web page containing your tale. Shogi is certainly one of the more interesting variants. That drop rule is a great slant and a wonderful example of the customs of a society reflected on the board of the local chess variant. Having played a few games that was the one thing that kept throwing me. At first I kept wondering how these enemy pieces kept showing up in my end zone. Then I remembered the drop rule. Next we will move on to the mother of all chess variants. The one from which they all sprung. Dating back to India in the 6th Century AD, this is Chaturanga. This link takes you back to your Homepage. Your Homepage is where you get a site overview. There you can see all of the resources on offer in this web site. Check out some of the various forms of chess that have evolved across the world.